The following steps are the same as those described in the section "When No Devices have been Paired" on the previous page. The waiting period during phone pairing will last for one minute. The pairing process will fail if the device is not paired within the given time. If the pairing process fails, you must start the process from the beginning. • Generally, most Bluetooth® Wireless Technology devices will automatically connect once pairing is complete. However, some devices may require a separate verification process to connect. Check to see whether Bluetooth® Wireless Technology has been properly connected within your mobile phone. 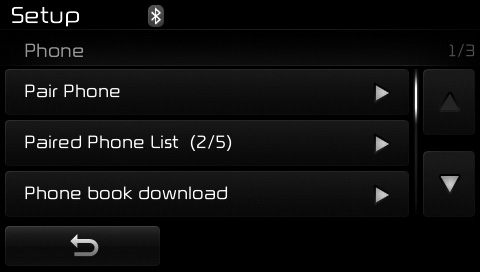 List of paired Bluetooth® Wireless Technology devices can be viewed at [Phone] [Paired Phone List].